Mediterranean fare and seemingly endless views of the Shanghai skyline. 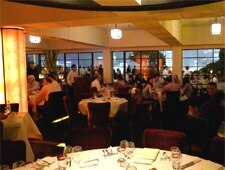 Lunch Mon.-Fri., Dinner nightly, Brunch & Afternoon Tea Sat.-Sun. : From its vantage point atop the Nissin Shipping Building, the rooftop terrace at M on the Bund offers seemingly endless views of Huangpu River and the buildings of Pudong. In the dining room, the ambience is sleek and stylish with white tablecloths and burgundy chairs. The restaurant caters primarily to visitors and expatriates. Starters from the Mediterranean menu range from Provençal fish soup to charcuterie including foie gras terrine, to a selection of Moroccan mezze like pigeon and octopus dishes. Continue with baby squid stuffed with herbed pearl barley in a romesco sauce or a hearty pig platter of suckling pig, pork belly and neck confit. The signature dessert is the Pavlova topped with fruit. Begin or end your evening with cocktails at The Glamour Bar, a sister establishment on the sixth floor.